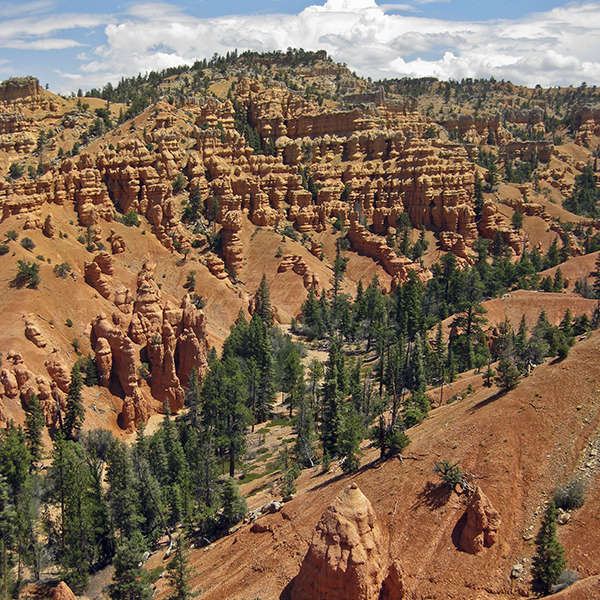 Located in a mini Bryce Canyon, this trail offers spectacular scenery without national park crowds. Before you leave the parking area, look north across UT 12 at the gray and orange cliffs. The place where the dark basalt sits against pink cliffs marks the Sevier Fault, one of three north-trending faults in southern Utah that define the transition between two major geologic provinces—the Basin and Range to the west and the Colorado Plateau to the east. You follow the Sevier Fault on this hike, making the Thunder Mountain Trail an interesting geologic venture. Head south and walk a few hundred feet down the trail before arriving at a wide wash. Cairns guide you across, and the trail continues on the other side. After a quick jog east, you resume a straight course heading south along the fault. For the first half of the hike, the trail gradually gains elevation while paralleling a drainage. Nearly all the scenery along the hike reflects influence from the Sevier Fault. Look to your left, then to your right. Just as you saw in the rocks north of UT 12, black basalt of the Sevier Valley dominates the landscape west of the fault line (to your right). Part of a volcanic flow that erupted 560,000 years ago, the basalt section dropped down along the fault over time. However, the fault block to the east (left)—the colorful cliffs of the Claron Formation—remained higher and thus more exposed to erosion. Likewise, the red talus slopes to your left reveal the Claron’s susceptibility to weathering and erosion. Composed of sandstone, siltstone, limestone, and conglomerate, the Claron Formation erodes into mystical spires, fins, and hoodoos that dominate the landscape in this small pocket of southern Utah. Since the Claron Formation breaks down easily, it doesn’t support much vegetation. Piñon and ponderosa pines pepper the red hills and cliffs to your left, while the hardened basalt flows to your right support denser tree growth. The trail passes under telephone wires around 0.7 mile, a reminder of your proximity to civilization and the highway despite your seemingly remote location; you may hear traffic noise for a good portion of your hike. At 1.5 miles, you arrive at a signed trail junction. Thunder Mountain Trail turns left, while Grand View Trail and Hillsdale Canyon continue straight ahead. Hugging the left side of the canyon, the Thunder Mountain Trail climbs loose slopes that require cautious footing. Soon after turning east, you pass a wooden sign for “Red Rock Canyon.” Stay left and continue hiking along the canyon wall until you cross the bottom of the wash around 1.75 miles. Follow the trail up the right side from here, resuming your ascent. Rock spires and columns surround you, with wildly shaped formations popping out of the fiery Claron hillsides. This is the same rock found in Bryce Canyon and Cedar Breaks National Monument. Without national park status, however, this trail in Dixie National Forest receives far fewer visitors. As the trail switchbacks up, you maintain amazing views spanning both east and west of a skyline reminiscent of fiery city skyline solidified in rock. You reach the top and hike along a ridge at 2 miles, with slopes dropping off steeply on both sides. Panoramic views of the Sunset Cliffs stretch before you, with the landscape opening west into the Sevier Valley and east into the Claron Formation. In its entirety, Thunder Mountain Trail is 7 miles one way, but the rangers at the Red Canyon Visitor Center suggest hiking to the unmarked Inspiration Point and back. You find a good turn-around spot at about 2.5 miles, where the trail drops down and takes a hard turn to your right (west). Feel free to continue exploring down the trail, but know that you’ve seen the most beautiful scenery along the hike and can feel satisfied turning back and retracing your steps to the trailhead. From the junction with Hwy 89 south of Panguitch, drive east on UT 12 for 2.5 miles. Shortly after passing mile marker 2, pull into the parking area on the right near the “Dixie National Forest” sign. Watch for pedestrians and bicyclists as you cross the paved biking path, and follow the road as it loops around to the gravel lot. Park your vehicle near the Thunder Mountain Trailhead sign. A posted map and restrooms are nearby, and the trail starts to the right of these facilities by the brown trail sign.